Kimi no Na Wa has changed a lot of things in the anime scene. 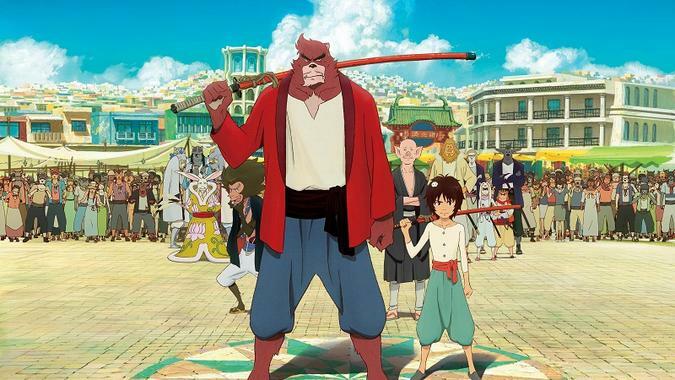 Until it took Shinkai Makoto to his new elevated place as the perceived successor to Miyazaki Hayao, it was Mamoru Hosoda who looked to be able to take that title, and indeed remains in my view the more established and consistent of the two. And while not the smash hit of Kimi no Na Wa, this movie made a big stir in Japan. It was well-marketed and well-received, with strong box office figures and positive critical response. It also seemed like my sort of movie, a coming-of-age tale about an acerbic young lad taken in by a monster to train in martial arts. Yet it didn’t have the resonance that Kimi no Na Wa is enjoying, nor was it a breakthrough. Anime fans enjoyed it, but it didn’t go much beyond that. And having seen it now, I think that’s appropriate. There’s a lot here that works very well, a lot of heart and a lot of imagination, but it falls well short of Summer Wars and remains too distant and too by-the-numbers to inspire love from a wider audience. The story is simple – little 9-year-old Ren runs away from home after his mother’s death. His father is missing and he dislikes his guardians, so becomes homeless. Fortunately for him, he’s spotted by Kumatetsu, a powerful but irresponsible beast creature, and taken in on a whim as a disciple. Taken in as a lonely human in a world of beasts, with a monkey and pig advising him and giving something of an echo of Journey to the West, Ren is given the new name Kyuuta and eventually becomes formidable. Unsurprisingly, he’s not the only one with a similar background, though, and might have to confront the darkness in the hearts of others. The core of the movie, the squabbling, eventual respect and finally strong bond between Kumatetsu and Ren, works very well. They argue, come to understand one another, and finally rely on each other to be complete. Unfortunately, the rest of the story hung around this core doesn’t cohere nearly so well. The love story is tepid and slow, Kumatetsu’s rival doesn’t get the development he needs and the antagonist is much too remote and peripheral to carry a meaningful climax to the story. There’s also no big pay-off here: it essentially feels like Ren ends up turning his back on everything that makes him who he is, and there was way more scope for examining how he could find a unique place in the human world afterwards. Ultimately, unlike Summer Wars or The Girl Who Leapt Through Time, and even more so than Wolf Children, the film doesn’t manage to clearly stamp its identity throughout its running time, and thus falls short of hitting hard and being truly memorable. If he wants his Studio Chizu to be a new powerhouse, Hosoda is going to have to up his game – especially with Shinkai now a few steps ahead.